The Battle of Iwo Jima was fought from February 19 to March 26, 1945, during World War II. With successes in the Marianas and the Philippines during 1944, Allied leaders began developing plans for the invasion of Okinawa. As this operation was intended for April 1945, Allied forces were faced with a brief lull in offensive movements. To fill this, plans were developed for the invasion of Iwo Jima in the Volcano Islands. Located approximately mid-way between the Marianas and the Japanese Home Islands, Iwo Jima served as an early warning station for Allied bombing raids and provided a base for Japanese fighters to intercept approaching bombers. Dubbed Operation Detachment, planning moved forward with Major General Harry Schmidt's V Amphibious Corps selected for the landings. Intelligence indicated that the island was relatively lightly defended, and planners thought it could be captured within a week of the landings. The believed state of Iwo Jima's defenses was a misconception that the island's commander, Lieutenant General Tadamichi Kuribayashi had worked to encourage. Arriving in June 1944, Kuribayashi had focused his attention on the construction of an elaborate system of interconnected tunnels and bunkers which were not visible from the air (Map). Understanding that the battered Imperial Japanese Navy would not be able to offer support during an invasion of the island, his goal was to inflict as many casualties as possible before the island fell. To this end, he encouraged his men to kill ten Americans each before dying themselves. Through this, he hoped to discourage the Allies from attempting an invasion of Japan. Focusing his efforts on the northern end of the island, over eleven miles of tunnels were constructed while a separate system honeycombed Mt. Suribachi at the southern end. As a prelude to Operation Detachment, B-24 Liberators from the Marianas pounded Iwo Jima for 74 days. Due to the nature of the Japanese defenses, these air attacks had little effect. Arriving off the island in mid-February, the invasion force took up positions. The American planned called for the 4th and 5th Marine Divisions to go ashore on Iwo Jima's southeastern beaches with the goal of capturing Mt. Suribachi and the southern airfield on the first day. At 2:00 AM on February 19, the pre-invasion bombardment commenced, supported by bombers. Heading towards the beach, the first wave of Marines landed at 8:59 AM and initially met little resistance. Sending patrols off the beach, they soon encountered Kuribayashi's bunker system. Quickly coming under heavy fire from the bunkers and gun emplacements on Mt. Suribachi, the Marines began to take heavy losses. The situation was further complicated by the island's volcanic ash soil which prevented the digging of foxholes. The Marines also found that clearing a bunker did not put it out of action as Japanese soldiers would use the tunnel network to make it operational again. 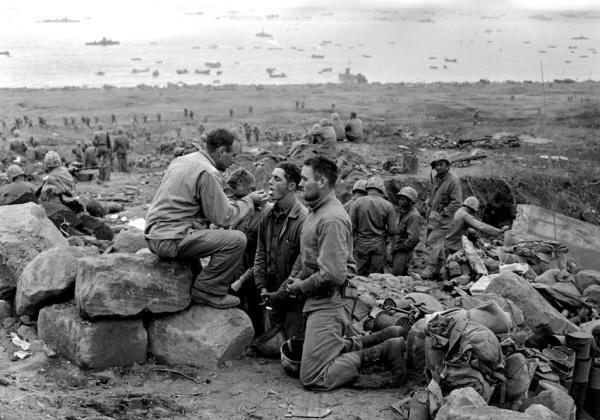 This practice would be common during the battle and led to many casualties when Marines believed they were in a "secure" area. Utilizing naval gunfire, close air support, and arriving armored units, the Marines were slowly able to fight their way off the beach. Around 10:35 AM a force of Marines succeeded in reaching the island's western shore and cutting off Mt. Suribachi. Under heavy fire from Mt. 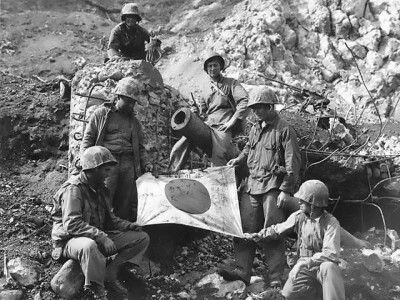 Suribachi, efforts were made over the next few days to neutralize the Japanese on the mountain. This culminated with American forces reaching the summit on February 23 and the raising of the flag atop the heights. As fighting raged for the mountain, other Marine units battled their way north past the southern airfield. 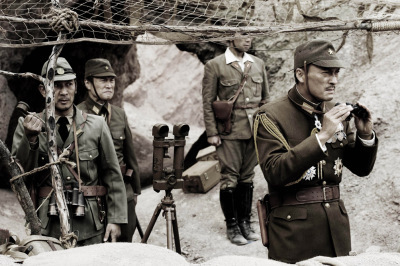 Easily shifting troops through the tunnel network, Kuribayashi inflicted increasingly severe losses on the attackers. As American forces advanced, a key weapon proved to be flamethrower-equipped M4A3R3 Sherman tanks which were difficult to destroy and efficient at clearing bunkers. Efforts were also supported by the liberal use of close air support. This was initially provided by the US Navy and later transitioned to the P-51 Mustangs of the 15th Fighter Group after their arrival on March 6. Fighting to the last man, the Japanese made superb use of the terrain and their tunnel network, constantly popping out to surprise the Marines. Continuing to push north, the Marines encountered fierce resistance at the Motoyama Plateau and nearby Hill 382 during which the fighting bogged down. A similar situation developed to the west at Hill 362. With the advance halted and casualties mounting, Marine commanders began changing tactics to combat the nature of the Japanese defenses. These include assaulting with out preliminary bombardments and night attacks. By March 16, after weeks of brutal fighting, the island was declared secure. Despite this proclamation, the 5th Marine Division was still fighting to take Kuribayashi's final stronghold at the northwest tip of the island. On March 21, they succeeded in destroying the Japanese command post and three days later closed the remaining tunnel entrances in the area. 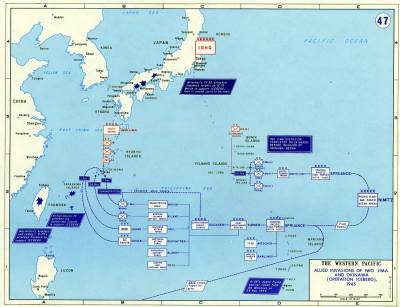 Though it appeared that the island was fully secured, 300 Japanese launched a final assault near Airfield No. 2 in the middle of the island on the night of March 25. Appearing in the American lines, this force was ultimately contained and defeated by a mixed group of Army pilots, Seabees, engineers, and Marines. There is some speculation that Kuribayashi personally led this final attack. Japanese losses in the fighting for Iwo Jima are subject to debate with numbers ranging from 17,845 killed to as high as 21,570. During the fighting, only 216 Japanese soldiers were captured. When the island was declared secured again on March 26, approximately 3,000 Japanese remained alive in the tunnel system. While some carried on limited resistance or committed ritual suicide, others emerged to scavenge for food. US Army forces reported in June that they had captured an additional 867 prisoners and killed 1,602. The final two Japanese soldiers to surrender were Yamakage Kufuku and Matsudo Linsoki, who lasted until 1951. American losses for Operation Detachment were a staggering 6,821 killed/missing and 19,217 wounded. The fighting for Iwo Jima was the one battle in which American forces sustained a greater number of total casualties than the Japanese. A bloody victory, Iwo Jima provided valuable lessons for the upcoming Okinawa campaign. 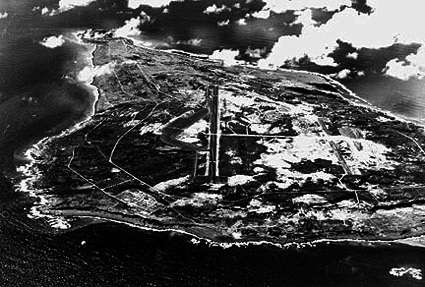 In addition, the island fulfilled its role as a waypoint to Japan for American bombers. During the final months of the war, 2,251 B-29 Superfortress landings occurred on the island. Due to heavy cost to take the island, the campaign was immediately subjected to intense scrutiny in the military and press.